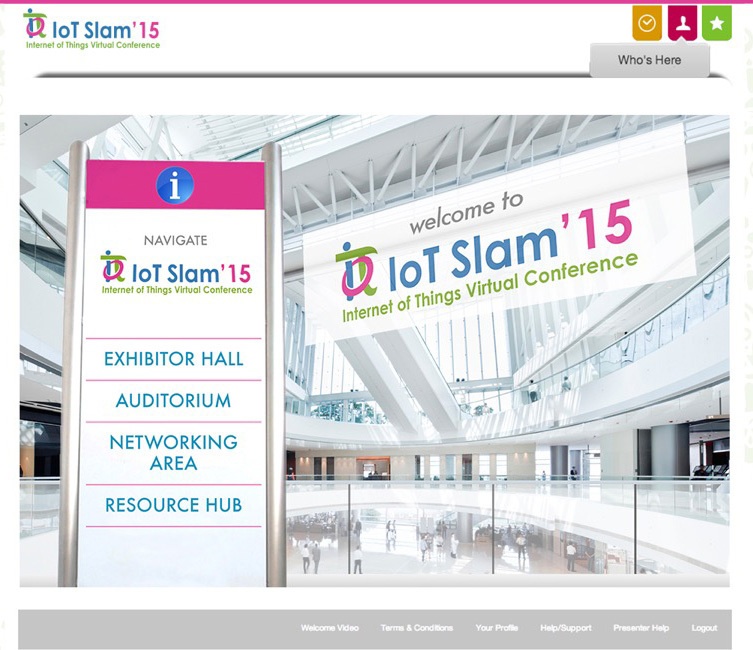 San Francisco, September 8, 2015 – IoT Slam 2015 Virtual Internet of Things Conference, is developed to promote collaborative analysis of the latest trends and challenges in the world of IoT (Internet of Things), will commence on December 9th 2015. Created and organized by experts and authorities in the IoT industry, and backed by the IoT industry’s’ movers and shakers, this inaugural online conference will highlight key research, important developments and defining accomplishments in the IoT world. According to leading experts and industry analysts, the broader IoT industry is driving the movement towards an “augmented reality” which is set to gain significant momentum over the next 12 months, and by 2020 more than 50 billion “things” will connect to the internet. IoT Slam gives industry leaders and professionals key insights into published research, unique and evolving ideas and IoT best practices, as well as an opportunity to network with leading experts in IoT. It is also an ideal opportunity for corporate leaders to acquire information on the latest innovations in IoT, generate new opportunities, exchange cutting edge thought leadership, and develop ideas on how to capitalize on what is estimated to be a market worth nearly 2 Trillion Dollars. Data and Information analytics combined with seamless secure interoperability will be key components in the evolution of IoT, especially now, as we prepare for continued, industry-wide impact on both small businesses and large corporations,” said Bill Mortimer, vice president of Strategic Marketing at Spirent Communications, and IoT Slam organizing committee Chairman said. “This conference brings together a global audience featuring members from the world’s largest Internet of Things CxO community – comprised of more than 7,000 c-level executive members, to share and analyze existing research, and tackle core topics including infrastructure, implementation, privacy and standards”. IoT Slam will feature world class keynote speakers, and thought provoking panel sessions and contain exclusive presentations from IoT experts on the current and future aspects of IoT shared by luminary industry leaders – whose contributions are helping to shape the future direction and outlook of the IoT industry. Additionally, organizers have arranged for an exclusive next generation virtual exhibition hall for attendees to meet in the cloud with leading technology and solution providers to get first hand opportunities to see latest offerings in the IoT space. “Cross industry collaboration is a critical way we will accelerate the benefits of IoT across our personal lives, industry and help create a better future across all continents – this forum is driving key aspects that make this happen,” said Jason Cook, BT America’s Security vice president and Fellow of the IoT Community Advisory Board. “We are experiencing a ‘perfect storm’ in the market today with the rapid convergence of BigData, Cloud and IoT. The IoT Slam event is a unique opportunity for participants to not only learn how to survive in this perfect storm but to thrive in it by getting actionable insights. In other words, a ‘suthrival guide’ based on deep expertise from key industry stakeholders and with the backing of the powerhouse IoT community,” said Mac Devine, vice president and CTO, Networking and Innovation Services, at IBM Cloud and Fellow member of the IoT Community Advisory Board. IoT Slam is the world’s first and largest virtual IoT conference and exhibition, covering Standards, Interoperability, Open Source, Integration, Security, Infrastructure, Business Models, Research, Innovation, Best Practices, Technology, Industry Implementation and Regulatory Compliance, in the world of IoT. The inaugural online conference will take place December 9th 2015. For more information, visit www.iotslam.com .